While ads often yield benefits for many people, there are times that there presence could already become annoying to others. This is true to many owners of the AT&T HTC One smartphones who are bothered of seeing mobile ads that often prompt with a green plus or star icon in the handset's notification bar. Generally, there are four common types of advertisements that frequently show up in an Android smartphone's notification bar. These would include the AirPush Ads, Push Ads, star icon, and the green plus + sign or blue plus + sign. Sometimes, these ads appear as an icon at the top of the screen in the Notification bar. And once you pull the notification bar down and touch the ad, a web site will open. 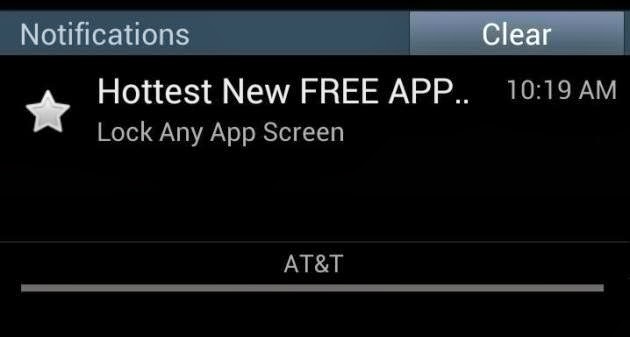 These ads or icons are referred to as push ads that installed along with a third-party application in your AT&T HTC One smartphone. For as long as you have the application on your phone, the ads will continue to show. NOTE: Push ads are generally designed to help app developers earn money from the apps they create. How to remove or stop these ads from showing in your phone's notification bar? If you find these mobile ads as sort of annoyance to your end, then you can always opt to stop them from appearing in your phone screen. Follow these steps to stop push ads from showing and get rid of the green plus or other icons in your HTC One notification bar. Step 1. Check and identify which of the third-party apps installed in your phone includes the push ads. In order to determine which app is causing the ads to show up, try to recall what applications you have installed prior to the appearance of the ads in your phone's notification bar. NOTE: You may also refer to or read customer reviews in the Play Store to know more about the apps you downloaded and installed in your phone. Often times, customer reviews would indicate which of the available apps contain these ads. Step 2. After reviewing the apps in your phone, uninstall or remove the apps that likely contained the ads from your device. Step 3. If the ads disappear, do not reinstall the apps. Instead, leave a review of the app in the Google Play Store to remind others about the ads it contains, so they won't experience the same issue you have. Step 4. If the icon or ads still show in the notification bar, even after uninstalling a suspected third-party application from your smartphone system, then you may need to perform a master reset to resolve the problem. HINT: Push ads are often seen in the notification bars of various Android smartphones, including the AT&T HTC One. The issue occurs after installing certain mobile application that includes the ads. While mobile ads help lots of online entrepreneurs to subsidize the costs of free apps, some ads are just annoying due to their location and timing. Because many mobile phone owners wouldn't want to be solicited while looking at their phone's notification bar, it is just reasonable to get rid of these ads.